Hong Kong, March 4, 2016 /ChinaNewswire.com/ - Laurence E. 'Larry' Lipsher, the U.S. tax C.P.A living in Asia for decades and who claims some of America's top entrepreneurs and business people residing overseas as his clients, has just published his latest book titled "Larry's 2016 U.S. Tax Guide 'Supplement' for U.S. Expats, Green Card Holders and Non-Resident Aliens in User Friendly English". This is a user-friendly guide for the U.S. tax filer who lives outside of the United States but is still required to file his or her U.S. tax return on an annual basis. This book explains, in an easy, informal and frequently humorous manner what the tax filer's requirements are and the pitfalls to look for to avoid what could otherwise be harsh penalties. 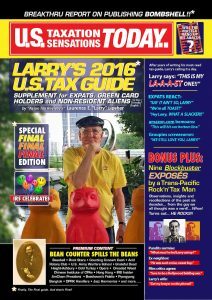 Aslan Tax Review's Laurence E. 'Larry' Lipsher has written six prior annual books, updating and expanding upon topics about that the American expat filer should be aware. Lipsher has spoken about taxes all over the world and is a popular 'tax entertainer'. In addition, this year's book also includes "Nine Essays from a Transpacific Rock 'n' Tax Man", a mini-memoir covering the author's years in the rock music business, overcoming a cocaine addiction to become a wine industry tax expert and then going through what is perhaps the weirdest manifestation of a mid-life crisis by starting all over again, 25 years ago, as an American accountant in the People's Republic of China. Lipsher, a past president of the American Chamber of Commerce of South China, wrote the Asian Tax Review for Tax Analysts of Washington, DC for 12 years. He's been featured on CCTV (China Central Television World Wide Watch, the most widely viewed evening television news program in the world (with over twice the viewing audience than watchers of the Superbowl) as well as CNN, CNBC, Reuters-TV and The Wall Street Journal-TV.